18k white gold,blue topaz and diamonds ring. A captivating design that will add a real modern touch to your style. Crafted in your choice of polished 18K gold, this ring features one oval cut 14.5 x 16.5mm blue topaz prong set at the center . The shoulders and the gallery of this ring are decorated with round cut diamonds in bead settings. 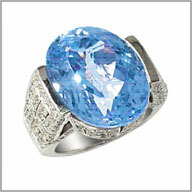 The total blue topaz weight is approximately 16.50ct and there are 168 diamonds for a total diamond weight of approximately 1.25ct. H in color and SI2 in clarity.